Under The Dome Radio podcast episode #08, Special interview with Sheila Brothers. Wayne and Troy interview great friend of the show (and Wilmington, North Carolina expert), Sheila Brothers! Sheila is the morning show on-air talent at Sunny 104.5fm in Wilmington, North Carolina. Sheila is so generous with her time, as she shares some fabulous information about what it’s like to have CBS’s Under The Dome film in-and-around her city! She gives a lot of great information about the cast and extras (aka #Domies), as well as details about all of the great things for travelers visiting Wilmington, North Carolina. * Sheila Brothers is a huge advocate of the North Carolina Film Crews and the Wilmington Film Commission. * Sheila is on-air on Sunny 104.5fm, weekday mornings, giving folks an energetic and upbeat morning show. * Sheila’s blog, with all the scoops about WilmyWood can be found here. 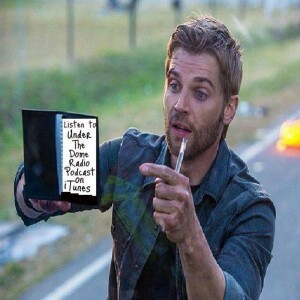 * Check out Sheila’s Sunny 104.5 YouTube videos we referenced, where she asks questions from us here at Under The Dome Radio, to some of the stars of Under The Dome! We are proud to be available in iTunes and the Apple iOS Podcasts app here. Please subscribe to our show in iTunes or the iOS Podcasts app. It’s totally free. By subscribing you will get each new episode automatically when they are released. And while you are there, please consider doing us a HUGE favor, and leave a good review for us in iTunes or the iOS Podcasts app. Thank you! If you would like to learn more about IIT (Institute for Information Technology), that Troy is helping out with in Haiti, visit ITTHaiti.org. Also, please “Like” their Facebook page here. Thanks to listener Joe McCready for capturing this photo!